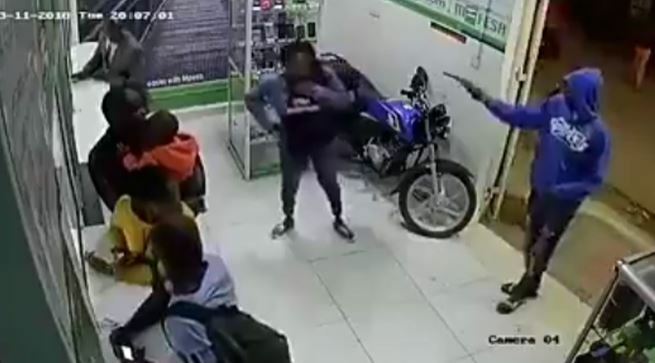 Yet another footage of a daring robbery has emerged online showing the shocking moment four armed thugs raided an M-Pesa shop within Nairobi. In the clip, one of the robbers, clad in a blue hoodie can be seen approaching the shop where several customers are being served. He is soon joined by three others who all walk in casually so as not to raise suspicion from passersby. The thug in the blue hoodie, who has since pulled out a pistol on the frightened customers, appears to give orders while manning the door. The other three thugs proceed to steal from the shop and the customers while stashing their loot in carrier bags. The gang leader also uses his pistol to smash two mobile phone display stands before passersby arrive forcing the robbers to flee in haste. The time stamp on the CCTV footage, although not so clear, indicates the incident took place on Tuesday, 13, November 2018 at around 8 PM.